Welcome to our Summer Beauty Series! We’ll be coming at you all summer long with beauty and wellness tips to help you sail through summer looking and feeling gorgeous! Check back every Friday for new content. When it comes to summer, the gap between beauty expectations and beauty reality can be…substantial. We think we’re going to look like glowing goddesses, but jet lag, late nights, and indulging in that third Pina Colada can wreak havoc on our complexions. Fear not – even if your summer schedule is stacked, we’re here to help you hold onto that “lit from within” radiance, with help from Dermalogica’s potent new BioLumin-C Serum. If you want Instagram filter-worthy skin this summer, harness the power of Vitamin C. While there are dozens of Vitamin C products available at the moment, beware – they are not all created equal. Some forms of Vitamin C are fairly fragile and can easily oxidize and lose potency. But, Dermalogica’s new BioLumin-C Serum contains one of the most stable forms of Vitamin C, and the packaging ensures that sunlight exposure won’t damage the product’s effectiveness. Vitamin C is truly a skincare powerhouse; it helps even skin tone, stimulate collagen growth, and protect against damage from free radicals. Plus, BioLumin-C’s natural, light citrus scent will have you thinking of summer sunshine the moment you put it on. A natural glow comes from the inside out. Quality topical products are important, but if you’re not feeding your skin with the good stuff, you’re never going to achieve peak summer radiance. So, don’t just put Vitamin C on your skin: eat it too! In addition to citrus fruits, tomatoes, mangoes, strawberries, papayas, and sweet potatoes are all loaded with Vitamin C, which is full of antioxidants and immune boosters. Also, zinc and omega-3 rich foods like fish, whole grains, nuts, and seeds will help keep acne at bay and calm inflammation. Dull, dry skin will stop a summer glow dead in its tracks. If you want to reveal smooth, clear skin, make exfoliating your top priority. For summer, upgrade from your usual face scrub and use a product that contains Lactic Acid. Lactic Acid stimulates cell turnover, and is far gentler than other exfoliating acids like Salicylic Acid and Glycolic Acid. 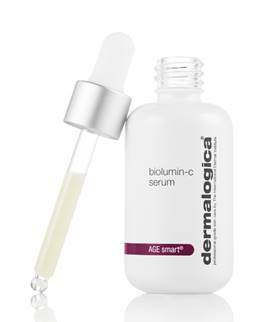 Dermalogica smartly paired the Vitamin C in their BioLumin-C Serum with Lactic Acid, which means your skin is gently exfoliated, hydrated, and brightened all at the same time. To keep your body nice and smooth, try dry brushing – it stimulates circulation (glow booster! ), and will gently slough off dead skin. Yes, we know, we know – drink more water. While we’ve all heard it a million times before, drinking an adequate amount of water really is crucial to maintaining that sunlight glow. When you have the proper amount of water each day, you’re less prone to daytime fatigue, your skin can maintain its moisture barrier, and your body can perform its natural detox processes more effectively. All of this adds up to a supermodel summer glow. If you’re finding it hard to start drinking the recommended amount of water right away, try hydrating smarter. Snack on water rich foods like cucumber, lettuce, zucchini, and watermelon, and try jazzing up your water with lemon, berries, or fresh herbs to make sure you you’re hitting your amount. When the days get longer and the nights get shorter, our sleep schedules take a major hit. If you’re looking to get the most summer radiance, then make sure you’re getting an adequate amount of rest. They don’t call it “beauty sleep” for nothing – your skin renews itself while you slumber, and anyone who’s woken up from a full eight hours can attest to how great their skin looks first thing in the morning. While you’re getting more sleep, make sure that your skin care products are working hard for you. BioLumin-C serum contains Palmitoyl Tripeptide-5; which will help reduce fine lines and wrinkles, and firm your skin through the night. With its potent cocktail of Vitamin C, Lactic Acid, and Tripeptides, BioLumin-C serum is the perfect potion to keep you glowing all summer long. Be sure to pair it with the lifestyle tips above to help you achieve #summerskingoals. BioLumin-C Serum ($87) will be available at Ulta Beauty, Bluemercury, and Dermalogica.com, on June 14. BioLumin-C serum contains Palmitoyl Tripeptide-5; which will help reduce fine lines and wrinkles, and firm your skin through the night. Want more amazing summer beauty secrets & tips and tricks? 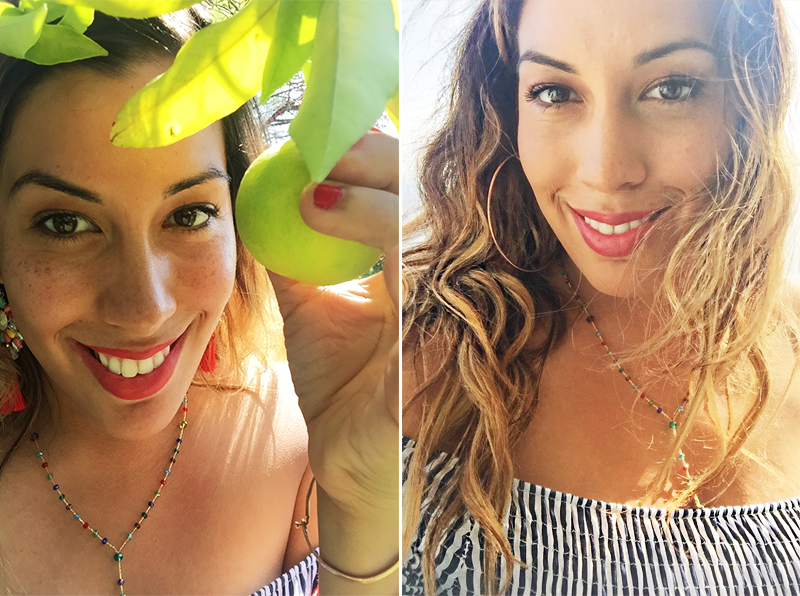 Find out how you can eat your way to beauty. Or if you’re more of a visual person, check out this cool beauty tutorial inspired by New York City below.